Kephess is back and uglier than ever! This encounter will test your operation group’s movement and positioning. I don’t feel this fight is as difficult as Kephess in Denova but it does offer up new mechanics which make this fight fun. He’s got a lot of health to burn through so you’ll have to take advantage of the local architecture and use it to your advantage in this encounter. This encounter is the first I can recall that actually removes a mechanic from Story Mode when transitioning to Hard Mode. The blue expanding circles that appear when Kephess jumps in the air in Story Mode is now removed. The new mechanics that you have to deal with are tricky to master but the more you do the fight the easier it gets. The fight begins the same way as story mode with tank swaps happening whenever one gets the electrical debuff. From there you will have to deal with some new tricks. These come in the form of white circles that appear on the ground in two random spots on the fighting area. These will appear when Kephess is linked by an electrical bolt to a pillar. DPS need to seek these out and stand next to them. After a few seconds they will link themselves to a player standing nearest to them and they need to be burned down by those individuals. Only those linked can do damage to them so you want to avoid healers getting linked. Healers, if these appear near you then run away. 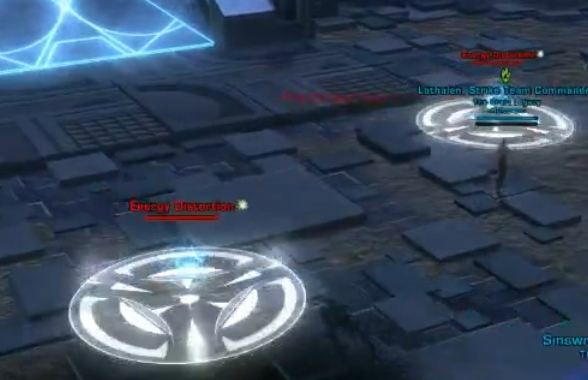 Tanks should do their best to avoid them but if they happen to get linked then it isn’t as big of a deal because when they get the electrical debuff from Kephess the distortion will be destroyed. This is the only new mechanic in phase one so it starts out fairly easy. However, if you haven’t been using the pillars in story mode effectively then you will need to in hard mode. 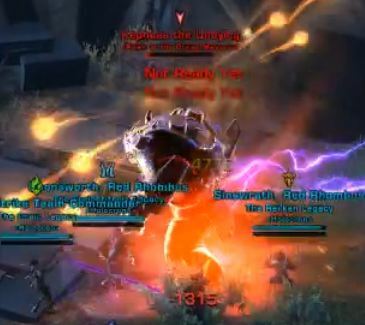 Whenever Kephess is linked to a tower, the tank needs to kite him over to that tower and stand between the boss and the tower. Not too far but not too close either. Kephess will then randomly target someone with laser blast. That player needs to run over to where the tank was standing and absorb the laser blast. Shields, health packs and heavy healing is required during this channeled cast. Once the cast is over he will be knocked over and you will start to do extra damage to him while he is on the ground. You will have only six towers to use during this phase to get him to 50% so make it count. If you like to see big crits you’ll like this mechanic. I said CRITS! Once Kephess reaches 50% health he will jump up in the air and land in the center of the room causing some blocks to rise and fall out of the ground in a wave. Just avoid them and carry on. Tanks still need to continue to swap but he no longer has the Energy Distortion mechanic. Instead he now has Corrupted Nanites which he will cast on random players. In story mode, the nanites do a DoT but eventually fade away. In hard mode, the only way to clear the nanites is to channel on the glowing towers that spawn. If you don’t clear them in time the DoT begins to stack and you will not be able to be healed through it. Channeling the towers also serves as a way to knock down Kephess in phase 2 as well. Kite him to the first tower where first two players with nanites will start channeling. 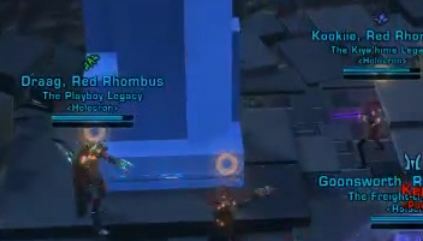 As soon as you break the channel it will destroy the tower and knock Kephess down allowing you extra damage on him. The second and third tower you will need to wait until three players are affected by nanites before breaking them. 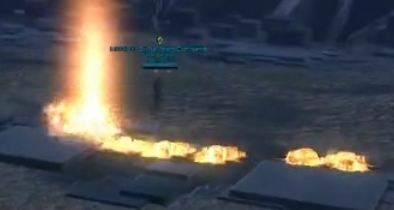 In addition to the nanites, Kephess will randomly target a player with Radioactive Barrage. It is essentially a trail of molten earth that will follow the targeted player. Just kite it away from the operation group. He also will jump into the air and target a player with a red circle. This is unavoidable so just keep away from that player and keep heals at the ready. For the last, tower (total of 4) the best strategy is to wait until he reaches 11% before breaking the tower. It doesn’t matter how many people have nanites on them at the time. 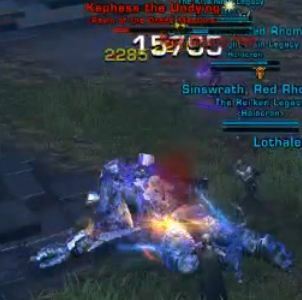 This will put Kephess on the ground for a few seconds, giving the ops group some extra time to damage him before he goes into his soft enrage. The soft enrage is at 10% so be sure you break the last tower before this mark. If you are successful you should be able to get him down to about 8% before he gets back up and starts his soft enrage. Kephess’ soft enrage will cause him to grow and start spitting out a ground cover blast very similiar to ‘Storm Protocol’ of our old friend Annihilation Droid XRR-3 in Eternity Vault. Keep moving and keep up the damage and healing as best as you can. This is the time to use your cooldowns and med packs if you need to. Spread out as much as you can to avoid running into eachothers circles and burn burn burn! This is one of my favorite fights in TFB because it requires high mobility and careful positioning. Have fun with it!